Where Does Cotton Cloth Come From? Have you ever wondered how t-shirts are made? Before shirts hit the shelves of your favorite stores or wholesalers, they go through a long process of refining from when they begin their lives as cotton. 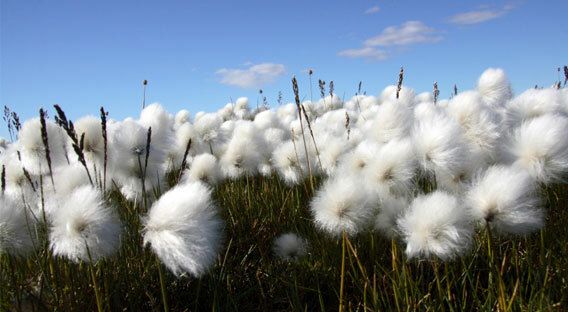 Cotton cloth comes from cotton crops, which are planted in the spring. The crops grow through the spring and summer, and the cotton fibers are harvested in the fall by machines. The harvested fibers are baled and stored until they’e ready to be ginned. At the gin, the bales are all cleaned and the cotton is separated from dirt and other debris. Then, the cleaned cotton is pressed into bales called “modules” for shipment. Once the cleaned cotton has arrived at its destination, the cotton is aligned in a process called carding. Carding naturally interlocks the cotton fibers, turning them into a soft, untwisted rope called a sliver. Mechanical looms spin fibers from the sliver directly into yarn that is woven or knitted into bolts of fabric. Singeing, which burns off the surface fibers from the fabric to make it smoother. The grey cloth passes over brushes that raise the fibers, and then is passed over a plate heated by gas flames. Scouring, a chemical washing process that removes natural wax and other impurities like seed fragments or dirt. The fabric is boiled in a sodium hydroxide solution in a closed, pressurized container. During this process, the natural oils and waxes left in the cotton are converted into soaps, the plant matter is softened, and any undesirable materials in the gray cloth are suspended, so that they can be washed away. The fabric is then rinsed and bleached, then rinsed again and dried. Finally, the fabric is dyed by immersing the fabric in a dye bath. After dyeing, the fabric can be printed on using block, roller, or screen printing techniques, though this isn’t required. The fabric is almost done! At this point, it undergoes mechanical finishing. This includes raising, or scraping the fabric with sharp teeth to make it hairier, softer, and warmer. The fabric also undergoes something called calendaring, where it is passed between hot rollers to become smooth, polished, or embossed. Chemical finishing treatments may be applied to make the fabric less flammable, crease resistant, and so on. If necessary, the cotton is shrunken mechanically so that shrinkage during consumer laundering is minimal. The finished product is sent off to manufacturers, who cut the cloth according to their patterns. The patterns are sewn together and inspected for quality. The finished wholesale t-shirts are either purchased by wholesalers like The Adair Group, or are distributed to retailers, and sold at retail prices.